Mass Lighting Services (MLS) was founded by Mark Massoud in 1996 after having worked with a respected lighting company in Melbourne for many years. Mark has acquired extensive experience in the lighting industry. It is never easy starting from scratch, however, with the help of his Dad and lots of hard work and dedication, Mark started up MLS. He had product knowledge and a commitment to excellent customer service, and added to these skills by obtaining his electrical licence. This allowed Mark to perform duties such as to connect and disconnect equipment for repairs plus replacement of all types of light fittings. In 2000 Mark started to work with neon lighting and he can supply and replace all types of transformers and supply and repair glass for all types of neon. 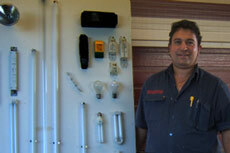 In 2001 Mark wanted to help his customers further and also expand his service offerings. He is now licensed to operate an elevated platform if required for high work such as car parks and sign lighting replacement, repairs and of course cleaning for a professional look. In 2003 Mark’s partner Denise suggested that Mark make Mass Lighting Services a registered company so now he is proud to call it Mass Lighting Services Pty Ltd. The company can now offer a range of services such as lamp replacement, lighting design, repairs and maintenance, appliance repairs, testing and tagging, a very reliable Electrical Contractor, Gerry Michailidis, which means the clients can have the very best of everything under one roof.